From dining under the stars in Botswana to picnics in the Caribbean, there's plenty of options for those who don't want a plain turkey and stuffing holiday. There is a myth about the Caribbean - that farm-to-table dining doesn't exist there. But in fact it does exist, and in some places, it's thriving -- a fact that comes in handy when contemplating Thanksgiving options this year. If you're not necessarily a fan of tradition, football or dedicating a day to the art of being a couch potato, there's an increasingly sophisticated variety of options to make Thanksgiving something slightly more colorful and adventurous. From a candlelit Thanksgiving dinner at a luxury lodge in the Belize jungle to chartered yachts with gourmet chefs onboard preparing your holiday feast in the British Virgin Islands, there are countless unorthodox options. The only limit is your sense of adventure (and your budget). Which brings us back to that myth about the lack of locally cultivated fruits and veggies, a misconception that actually applies to far more than just Caribbean island countries. It really encompasses all tropical destination dining and our preconceived notions about what such meals might include. 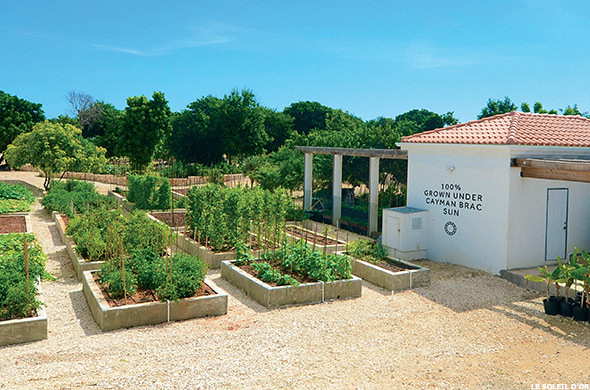 An increasing number of islands around the world are now touting their organic gardens and locally sourced food as a major selling point. Le Soleil d'Or, meanwhile, bills itself as the Cayman Islands' first and only farm-to-table destination and is inviting families to escape the chores of Thanksgiving this year. Instead it asks guests to sit back, relax and enjoy the resort's organic offerings. Locally sourced meals on tropical islands, however, are just one of many memorable possibilities to consider. Also among the most intriguing is dining al fresco in Okavango Delta. This option, offered by Rothschild Safaris, is organized by Chitabe Camp in Botswana, and includes a traditional Thanksgiving dinner (for as many as 16 of your nearest and dearest) served family style under the stars, in one of Africa's last remaining great wildlife habitats. Experiences this unique may even bring your family closer together. "There's nothing I love more than spending time in the African bush with my family," says Leora Rothschild, founder and president of Rothschild Safaris. "While the holidays are always a time for love and gratitude, sometimes getting away with the ones we love most, lends a unique perspective on everything for which we have to be thankful." While the holiday is just a few weeks away, it's not too late to break from tradition and try something different this year. Think about it, Thanksgiving is a long weekend - four full days to add to a getaway...Why not make the most of it? Here's a look at some additional Thanksgiving options that combine a picturesque location, with a Thanksgiving meal to remember. On the ultra luxurious Turtle Island, Thanksgiving, and the celebration of abundance, will not be confined to a mere week. This year, the island is starting a new tradition - a month-long Thanksgiving celebration. Each week between November 10 and December 10, the 500-acre, private island resort will host a different, high-profile chef from around the world who will be tasked with using locally grown produce and seafood caught from surrounding waters to create a memorable holiday feast. An example of farm-to-table at its finest, and a pioneer in sustainable hospitality, Turtle Island has three acres of gardens (which were a large part of the owners' inspiration for the month-longThanksgiving festivities). "When each of the chefs arrive, I will be spending a day with them, exposing them to our local markets - both fish and fruit and vegetable markets - so they can taste all of these things and imagine how they might put them into new combinations," says Turtle Island's Monica Laurence, who came up with the idea to host a new chef each week for a month. "On Turtle Island we have an abundance of seafood," Laurence continues. "Every day fisherman come to our dock offering the catch of the day - everything from Spanish mackerel or lobsters that have just come in, to octopus...There is so much interesting opportunity for food on the island, even the snails are wonderful eating." The four guest chefs will draw upon the local seafood, meat, fruit and vegetables to create their own unique take on Fijian cuisine and Thanksgiving. "Turtle Island is a place that brings your heart alive," adds Laurence. "When you come here you feel like you've come home, between the beauty of the place, the smiles and laughter of the Fijian people and newfound friends around table." Say goodbye to turkey and hello to fresh-caught lobster, sunshine and plenty of pampering. 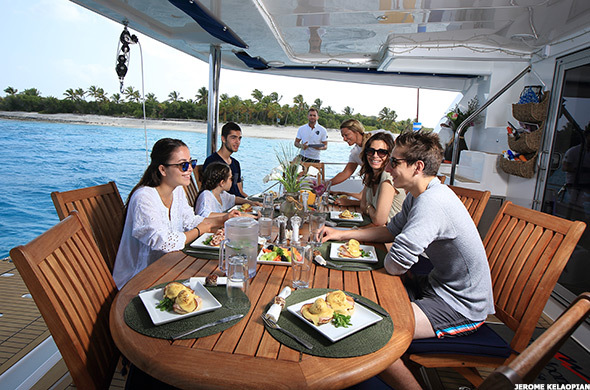 The Moorings, a Florida-based company, specializes in providing vacations aboard chartered yachts that, depending on the size you rent, come complete with chef and crew. The company has more than 400 yachts that it sails to some 20 destinations around the globe. Among the most popular Thanksgiving offerings, says Moorings Assistant Marketing Manager Jennifer Covington, is a cruise around the British Virgin Islands with a personal chef. "The chef will make five-star meals, anything you request," says Covington. "We can prepare a turkey, or a less traditional seared tuna, grouper and lobster. You can escape the crowds on a boat, you're not at a resort with all these other people dining, you're on your own catamaran in an intimate setting, where you can relax, enjoy and let someone else do all the work for you." In addition to indulging in a fabulous holiday meal on a yacht, you will wake up in a new anchorage every day, with the extremely difficult chore of deciding whether to go diving, snorkeling or sunbathing. The yachts can accommodate parties from two people to ten. "Why spend your time in the kitchen, when you can spend it on a boat?" adds Covington. 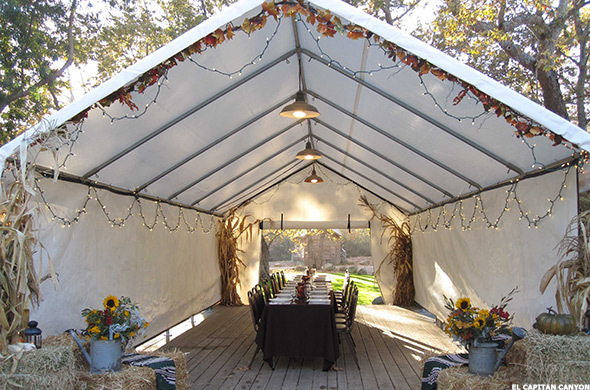 Located among 300 acres of undeveloped foothills, El Capitan Canyon offers yet another take on Thanksgiving worth considering. 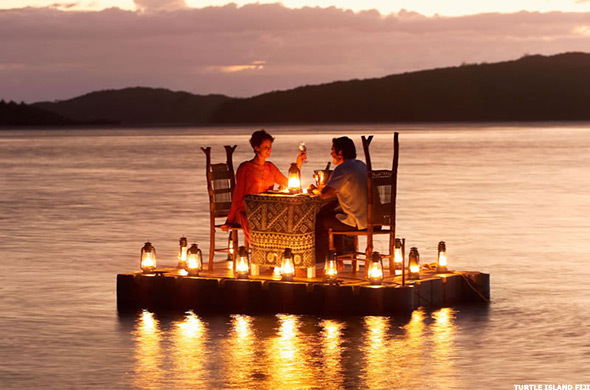 Here, the holiday involves a lavish, banquet style dinner complete with all of the classics, in a creek-side setting that includes luxe, furnished safari tents or cedar cabins. "We've been hosting people in some form or another for about 10 years," says Resort MangerTerri Bowman of the Thanksgiving celebration. "We do a very large, traditional Thanksgiving buffet. It's grown to be quite an event... It looks like a Thanksgiving wonderland, with all of the fall foliage and things we gather from the canyon." And like many of the other locations on this list, at El Capitan Canyon there is a substantial organic garden, from which much of the holiday meal will be plucked. Meanwhile, other activities in this pristine nature setting include yoga, star gazing and movie night. "Thanksgiving is a really beautiful time of year here," adds Bowman. "The sycamore leaves are turning, even in these dry years, and we're surrounded by 2,500 acres of state and national park." If you're reluctant to completely forgo all of your family's Thanksgiving traditions, Le Soleil d'Or may have just the solution. The Cayman Island resort is inviting visitors to work with its chef to incorporate a little piece of home into its tropical island holiday meal. And with an impressive 20-acre organic farm, there will be plenty of ingredients on hand to create Le Soleil's farm-to-table feast. Capitalizing on the Caribbean farm-to-table theme, the Thanksgiving opportunity here includes a tour of the Le Soleil d'Or farm, a family cooking class, and a holiday spread for up to ten people. "The resort owner is of Mediterranean descent and grew up on a farm herself," says Le Soleil's Sharon Lee Thony, of the resort's enormous garden, which remains largely atypical in this part of the world. "In the Caribbean it's hard to grow fresh produce, but eventually one tomato plant became two and it kept growing, to what is now a 20-acre operating farm. And every morning the staff harvests everything from fresh chicken eggs, to citrus fruits, to things you wouldn't find there, such as Italian eggplant." When not feasting, guests here can snorkel, kayak, take group fitness classes or slow it down with a spa treatment. One last option for those looking to ditch the dining room table and give thanks another way this year. The Hilton Aruba Caribbean Resort & Casino will create a Thanksgiving picnic for you and your family at one of the island's many iconic and picturesque locations. Perhaps the most basic Thanksgiving offering on this list, the resort will provide turkey sandwiches, a decadent cheese spread, potato salad, croissants, fresh fruit and more . Also, to get the atmosphere right, the resort will spread a blanket for you at a historic lighthouse, an old Dutch windmill, or perhaps a glittering lagoon. "Not everyone wants to do traditional turkey for Thanksgiving," says Arianne Valentino, the resort's director of sales and marketing. "So we came up with this picnic basket idea, and we will take you wherever you want to go and when you're ready we'll come back and pick you up." This opportunity focuses on exposing guests to areas of the island they might not otherwise see, says Valentino, taking them beyond the resort's confines to explore Aruba's varied topography and history. The suggested picnic locations include a beach frequented by locals, the Ayo Rock formations near Ayo village and even the island's historic oceanfront gold mine ruins (which date back to the 1800s). "You will still have some of the elements of the traditional Thanksgiving," says Valentino. "But it's not an actual sit down at the table. 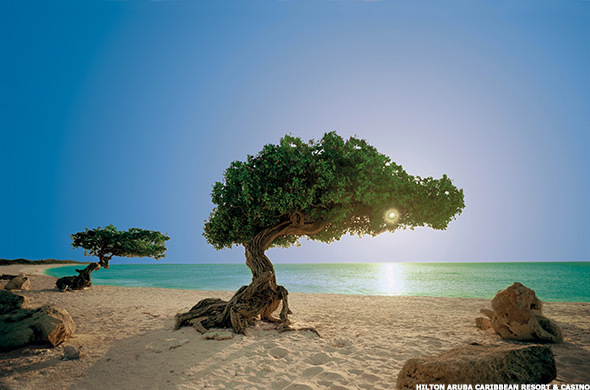 You get to enjoy a different side of Aruba, and something different then you would if you were eating at the hotel or at home."